The Palo Alto Networks® PA-3200 Series next-generation firewalls are designed for data center and internet gateway deployments. 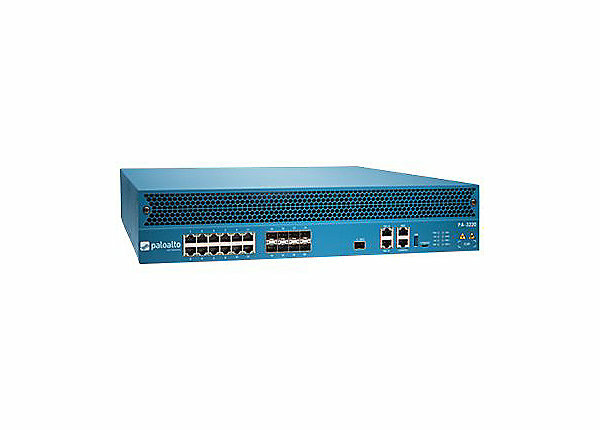 This series is comprised of the PA-3220, PA-3250, and PA-3260 firewalls. These models provide flexibility in performance and redundancy to help you meet your deployment requirements. All models in this series provide next-generation security features to help you secure your organization through advanced visibility and control of applications, users, and content. PA-3220 firewall—Ports 13 through 16 are SFP (1Gbps) and ports 17 through 20 are SFP or SFP+ (10Gbps) based on the installed transceiver. PA-3250 and PA-3260 firewalls—Ports 13 through 20 are SFP (1Gbps) or SFP+ (10Gbps) based on the installed transceiver. Download the Palo Alto Networks PA-3220 Specification Datasheet (PDF).